Okay, my inner hippie chick is really singing. 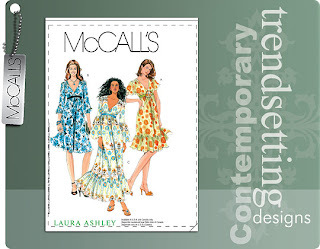 These are my favorite two patterns from McCall’s new spring line up. Aww…I just love the flounciness of it all, particularly the middle dress. You know me and my maxi dress obsession. I can see this in a delicate cotton lawn. And according to the line drawing, there is some smocking or ruching on the shoulder. I think that’s a nice touch. 5812 And don’t get me started on long skirts. This would great in a crinkled cotton gauze paired with a camisole. I love this whole look. Perfect for North Carolina’s warm springs and humid summers. I still don’t have any real sewing plan to speak of. My sewing room is a chaotic mess right now. I was making another tea wallet in a brocade, and got distracted mid-production. Last night, I didn’t do any sewing at all, but I watched Youtube videos all night. Hey, at least I wasn’t sitting in front of the TV, not that I’m knocking people who do… Needless to say, I was unproductive. My mind is more on the crafty side of things. There are some cute Amy Butler sewing projects I’m interested in trying. And since Fabric.com is having a sale on quilting fabrics, I may be able to indulge in a little splurge. I’m still feeling a little guilty about my defunct Summer 2008 Swap. But I don’t think I’ll be doing any swapping for a while. I’m okay with a few orphaned numbers. I see you with these dresses, sure. 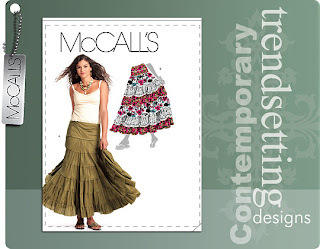 you can make the pattern for the skirt. is very easy to make a piece of the hip and go gradually increasing the length of the pieces. Wow! This is great. Unfortunately, I don’t plan on buying any fabric for a while, but since the coupon doesn’t expire until the end of the year, I’ll just put a reminder on my calender. BTW-I feel you on the maxi dresses. I just love them! Wow! Wonderful! I’m sure my blog readers would like this offer very much. Thank you “sew” much for the link to Fabric.com that you have on your blog page. As a token of my appreciation, I would like to offer you a $10 gift certificate to use towards a future purchase with Fabric.com. In addition, I would also like to give you a $5 coupon code for you to post on your blog for your readers. The coupon is valid for a one-time purchase per user and does not expire until the end of year. Please call me at 1-888-455-2940 ext. 214 or send me an email to tracy@fabric.com to receive your coupon codes. Again, thank you “sew” much for your efforts! Happy blogging to you!